Once upon a time, I had a Victorian house with many large windows facing in each of the compass directions. We had large plants in the south and west facing windows, and smaller plants in the north and eastern ones. When we moved into a Cape Cod style house in the middle of a forest, we donated the larger plants to our children’s’ school. I have struggled to keep any of the smaller plants alive since then. This is truly an embarrassment as a master gardener. I visit the homes of other MGs and I see magnificent specimens, and wonder what is wrong with me. One of my fellow MGs suggested that I become interested in Begonias. “Simple to grow, no problem at all” she has assured me. I grow begonias all summer long in pots on the patio, deck and front porch, perhaps this would be a good plant in which to grow my ‘house plant confidence’ again. 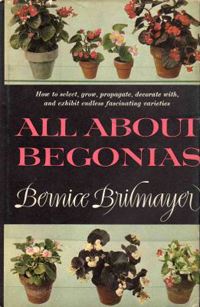 From a used book shop, I purchased All About Begonias by Bernice Brilmayer, published by Doubleday & Company in 1960. (The original purchase price was $5.95). On the back cover, I am informed that Mrs. Brilmayer held a full-time job writing TV commercials, had 3 children and a husband to tend to all the while becoming a respected authority in the field of Begonias. In fact, she had more than 350 varieties of this plant. Surely, even someone with a houseplant problem like me could learn to master this plant species with her assistance. What is a Begonia? Mrs. Brilmayer describes over 600 varieties in this book alone. Not every plant that has begonia in its name is a true begonia. To be classified as a begonia, the plant’s flowers should grow in branching clusters. The flowers have modified leaves that encase the buds, called brackets. The same plant will grow both male and female flowers. The male has larger petals, but the female has a three-winged, seed-bearing ovary immediately under the petals. Leaves are usually lopsided; one side of the main vein is larger than the other. Leaves alternate up the stem with new leaves emerging from stipules or leaf-like sheaths. Traditionally Begonias were grouped not by growth habit but by type of root: bulbous, tuberous, rhizomatous, and fibrous. But this was not always clear-cut. Begonia growers are now classifying the plants according to their growing habit, which makes it easier for the rest of us to select plants that will fit our growing conditions. My summer begonias have been of the Angel-wing, basket, and summer-blooming varieties. I currently have a Hairy-leaf and a Rex as household plants. There are still Semperflorens or Wax varieties, Upright and Branching, Winter-blooming, and lastly the Odd and Rare Begonia Varieties to get to know. Each of these varieties has its own chapter in Mrs. Brilmayer’s book. After learning everything necessary to grow Begonias, and each of the specific types, there is a chapter on how to propagate by stem cuttings, leaf cuttings, layering, rhizome cuttings, division of tubers, and from seed. Problems and pests are covered in their own chapter, again with great photography. Mrs. Brilmayer includes a chapter on Decorating with Begonias, where she recommends varieties to compliment your existing color décor. The final chapter is devoted to exhibiting your Begonias, in your home, in your garden, and at the garden show. It may be a few more years before I am ready to show at the America Begonia Society Show. But with Mrs. Brilmayer’s help, I just might get there.